Introducing "EDORA" Scarf - a collection inspired by Flexibility. As how we wanted to be flexibel, this scarf has two reversible sides with different artwork and color, so it can be worn both sides. - Machine wash is possible, hand wash is better. within the same day (if payment is done before 3pm every working day), and 1 working day after if later. - The scarf is 110cm x 110cm, with 2-10cm length tolerance due to the nature of material. 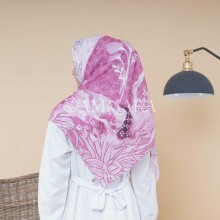 - This scarf is a ready stock item thus CAN NOT BE PERSONALIZED.